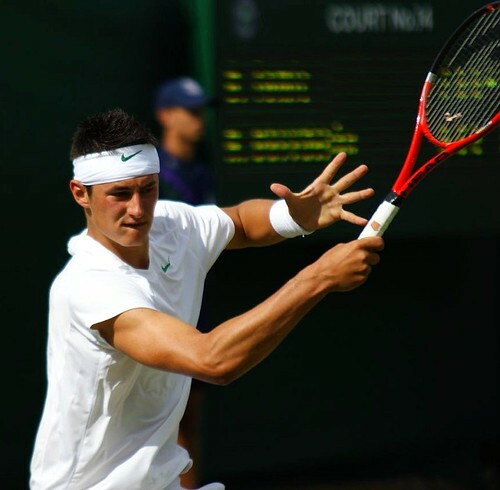 Back in the summer of 2011, Bernard Tomic was setting alight the tennis world with an impressive Wimbledon run, making the quarter finals as a qualifier. His mature performances that tournament led to many believing they were seeing a grand slam champion and/or World No.1 in the making. Since then, things haven’t been so easy for the 19 year-old. Tomic is currently on a six match losing streak, doing very little to impress after a promising start to the year where he made the fourth round of the Australian Open, losing in straight sets to Roger Federer. The Aussie’s temperament has always been questioned and he is never far from controversy – Tomic and his team famously rejected the requests of Lleyton Hewitt for a practice hit. Hewitt’s manager claimed that the reason given for this was that Hewitt was considered “not good enough” but this was a claim denied by Tomic himself. More recently, Tomic was involved in a police stand-off over a dispute about traffic tickets he had accrued in his Orange BMW M3. Much like another Australian with Croatian heritage in Jelena Dokic, Tomic’s controversies are not just on himself but also due to an overbearing father. At 16, Tomic was banned from the ITF Tour for a month after his father, John, had forced him to default the match by walking off due to the bad decisions he felt he had been on the wrong side of. He is also alleged to have threatened Tennis Australia officials with the possibility of his son switching countries and representing Croatia on a national level after feeling Bernard was treated badly by the organisers of the Australian Open in 2010. During the Miami Masters, Bernard even asked the umpire if he could remove his dad from the stands as he felt he was an annoyance. While Tomic has made his dislike of the clay clear in the past, he at least looks like is trying to do something to improve it by playing as many tournaments as he can on it, rather than shying away like some players do. In an interview for the ATP website before the Monte Carlo Masters, Tomic felt he had new-found confidence and it was there to be seen as he defeated Denis Istomin in the first round to earn his first main tour win on clay. He felt that is issues on the dirt were mental and physical as opposed to a skill-set not suited to the surface. Unfortunately since then, the results have been slow to follow but he did pick up his first French Open win with a straight sets victory over Andreas Haider-Maurer, but was dispatched of with ease in the next round by Santiago Giraldo. Most recently, Tomic was defeated (and bagelled) by Benoit Paire and lost to Thomasz Bellucci after having a 4-1 lead and a great chance to at least take a set against a good clay courter. While it is definitely far too early in Tomic’s young career to write off his chances of ever succeeding on clay, major improvement will be needed in 2013 if he is to reach the ranking heights that many are expecting of him. With the clay season now over for himself, Tomic has the chance to redeem himself on grass in the Olympics after a poor Wimbledon outing where he was sent packing in the first round by David Goffin. The loss of 350 points is a big issue for him and may see his ranking slip a fair bit if he does not have a good US hard court season. Tomic, along with Ryan Harrison and Milos Raonic, is only one of three players born in the 90’s to be in the current top 50 so even if he hasn’t lived up to expectations from last year he is still progressing well for age and has plenty of time before he can be written off as overhyped. With very few ranking points gained pre-US Open last year, a good performance in the Olympics, Cincinnati or Canada could set him up nicely for a seeding at the grand slam and a good chance to make the second week with a favourable draw. Tomic is already a winner there as a junior in 2009, having beaten Chase Buchanan in the final. Even if Tomic has not gained the results on the clay swing this season, I think the experience will be good for him and he can only improve. For now, he needs to concentrate on putting some good results together in North America and defending the points he gained in Asia. If he maximises his potential as many think, in three or four years we could be seeing Tomic following the footsteps Lleyton Hewitt in picking up a grand slam or even world no.1 after the current dominant crop retire or fall out of contention. Ashleigh Barty will be in the main draw of a Grand Slam for the first time after the junior Wimbledon champion won the Australian Open wildcard play-offs. The 15-year-old from Queensland beat Casey Dellacqua, Arina Rodionova and Olivia Rogowska along the way. In San Luis Potosi at the heart of Mexico the Junior Davis Cup and Fed Cup by BNP Paribas took place pitting the best 16 and under players of both genders against each other. Big names such as Novak Djokovic, Rafael Nadal, Lleyton Hewitt and Juan Martin del Potro as well as other current pros Anastasia Pavlyuchenkova, Gael Monfils, Marin Cilic and the Radwanska sisters have all participated in the event previously. Last year it was Japan for the boys and Russia for the girls who took glory. Twelve months on Great Britain and Australia were respective favourites and top seeds with Russia unable to qualify and retain their title. A total of 32 teams from 23 countries attended with the 16 from each gender split into four groups for the round robin stage and the final position of each team deciding which play-off they would enter. In the Davis Cup, Great Britain and Italy won all three of their matches to top their groups while France and South Africa progressed based on the number of rubbers won. The results were more clinical in the Fed Cup as Australia, the Czech Republic, Italy and Canada all went through to the semi-finals with three wins from three. With the semi-finals taking place on October 1st, the top two seeds in both events made it to the final the next day. Great Britain, coached by Greg Rusedski, secured their second final berth in three years with a 3-0 victory over France. The British trio of Evan Hoyt, Luke Bambridge and the highest ranked player in the tournament Kyle Edmund had only lost one rubber en route to the final which they’d contest with Italy who had two undefeated players in their ranks. Gianluigi Quinzi and Stefano Napolitano helped their country to a 2-0 win over unseeded South Africa. An Australian team featuring junior Wimbledon winner Ashleigh Barty and a Canadian team welcoming back their star name Francoise Abanda were taken into a decisive doubles rubber which they both overcame. Despite the return of Abanda, she lost her team’s first rubber of the tournament conclusively to Italy’s Giulia Pairone but her teammates Carol Zhao and Erin Routliffe ensured they reached the final by taking the tight deciding rubber 4-6, 6-2, 7-5. Barty and her partner Belinda Woolcock meanwhile defeated Czech pair Aneta Dvorakova and Barbora Krejcikova who had won a professional ITF doubles event earlier in the year. On the last day all the final positions were decided in various levels of play-off matches ranging from 16th-12th to the main draw play-off. Great Britain claimed their first ever Junior Davis Cup after winning the battle of the unbeaten players as Italy’s undefeated pair lost in singles rubbers to Hoyt and Edmund. France beat South Africa 2-0 to take third. Despite her lack of matches, Canada chose Abanda and Zhao but they were dispatched in straight sets by Barty and Woolcock to give Australia their first Junior Fed Cup title since 2007. The Czech Republic beat Italy to claim third spot with no doubles rubbers contested in either event. The results were continued boosts for the winning nation’s tennis as Great Britain recently had Oliver Golding claim the junior US Open crown while Australia’s Sam Stosur secured the women’s title at Flushing Meadows to coincide with Barty’s success. For a full list of draws, players, scores and final standings click here. With 19 of the top 20 ranked juniors in the world competing, the Wimbledon boys’ singles event had an abundance of names to look out for in the future. World number one Jiri Vesely was looking to add to the Australian Open crown he won earlier this year whilst form players going into the tournament included Roland Garros finalist Mate Delic, Gerry Weber Junior Open winner Dominic Thiem and Britain’s own Liam Broady, title-winner at the AEGON Junior International. Round 1: Several seeds dropped in the opening round including Austrian Patrick Ofner (12), Spain’s Andres Artunedo Martinavarr (14), Joao Pedro Sorgi (11) and but the biggest was third seed Hugo Dellien who lost in straight sets to Kaichi Uchida of Japan. There was great joy for home supporters with British seeds George Morgan, Liam Broady and Oliver Golding joining wildcards Joshua Ward-Hibbert, Oliver Hudson, Evan Hoyt and Kyle Edmund in the second round. The latter beat Sorgi 6-3, 6-3. Round 2: Britain’s delight soon turned to despair in the next round with only Liam Broady making it to the last 16. The prospects didn’t look good for Broady either as top seed Jiri Vesely awaited in the third round. Fourth seed Oliver Golding’s exit to wildcard Jason Kubler proved to be the biggest casualty of the day but more seeds lost including Spain’s Roberto Carballes Baena (6), Australian Andrew Whittington (9) and Philippine Jeson Patrombon (13). Hassan Ndayishimiye, the first player from Burundi to play at the Championships, also went out. Round 3: Only three seeds made it into the last eight and that didn’t include the top two seeds. Czech and junior world number one Jiri Vesely succumbed to Liam Broady 6-4, 7-5 and Brazil’s Thiago Moura Monteiro was defeated in the other half of the draw by Aussie 16th seed Luke Saville. Germany’s Robin Kern, who beat Andrew Whittington the previous round, continued his giant-killing exploits by taking out Filip Horansky (5) while seventh seed Dominic Thiem lost to Belgian Julien Cagnina 6-4, 6-2. Quarter-finals: Liam Broady won a titanic last set against Robert Kern 13-11 to keep British hopes alive. Kaichi Uchida made it to the last eight and progressed further thanks to another struggle. The unseeded Japanese found himself a set down to eighth seed Mate Pavic but won a second set tiebreak 9-7 before taking the third 10-8. He joined the two Australians of Luke Saville and wildcard Jason Kubler in the semis after their wins over Joris De Loore and Julien Cagnina respectively. Semi-finals: Liam Broady faced wildcard Jason Kubler, the man who took out his compatriot Oliver Golding but he was given the chance of becoming the first British winner of the Wimbledon boys’ singles since Stanley Matthews in 1962 after coming through 6-4, 6-3 in 79 minutes. His opponent in the final would be Luke Saville, who had also been to the final of his home major the Australian Open where he lost to Jiri Vesely. Saville beat Kaichi Uchida 6-4, 6-1 and recorded 31 to seven and never gave his opponent a break point opportunity. Final: Liam Broady (15) vs. Luke Saville (16). British hearts were crushed as Saville emerged victorious despite being outplayed in the first set and almost getting blown away in the second. Broady was serving 6-2, 4-3 up before being broken and never won another game in the set. An incredible point panned out in the third set but with Broady failing to break back after going down 3-1 early on there was no way back and Britain’s hopes of a homegrown winner in Wimbledon’s 125th year were dashed. To see the full list of results then a drawsheet is available via the official Wimbledon website. Bernard Tomic loves a big occasion. Despite sitting at #158 before Wimbledon began he’s now reached the fourth round after knocking out world number five Robin Soderling. Soderling may well have been unwell during the match but Tomic must be given credit for handling his win like a top 10 player, brushing the Swede aside in a first set lasting just 17 minutes before seeing it out in straight sets. BBC commentary constantly referred to Tomic’s view that his ultimate strength is finding his opponent’s weakness. That is a philosophy which will win him many matches in the future and, based solely on his third round victory, a potential major. What’s surprising is how his record before his visit to south west London this year has been so disappointing compared to his achievements elsewhere. The 18-year-old qualifier has made the third round of the Australian Open this year and has been to the second round of his home major the two years previous to that. Ace of Baseline has been following Tomic since the early days of the blog’s creation (he’s the second one along on the top-right banner) and his record on the ATP World Tour has been nothing special. His two career title successes have come on the ATP Challenger Tour and his last triumph at that level came in February last year whilst his other was 12 months before that with both coming in Australia. Along with those wins Down Under he took the junior Aussie Open crown in 2008 aged just 15. Perhaps age is the key. He is only 18, still eligible for the juniors and more ATP World Tour events instead of Challenger tournaments in the future will see his progress quicken. His coolness on the show court against Soderling and his ability to come back from two sets down versus Igor Andreev in round two are good traits. He has the mentality to succeed and seems to lap up a pressurised situation. His next match will be against Xavier Malisse and his chances of reaching the last eight are seemingly decent against the 30-year-old Belgian. 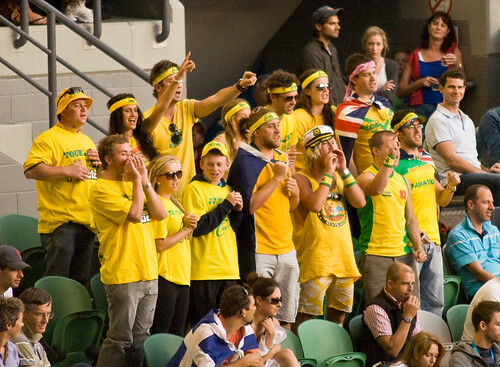 We’ll learn a lot more from Tomic in that match now he’s set to be watched by more and more eyes. After progressing further than Aussie legend and their last man to win a Slam Lleyton Hewitt, Tomic will become the new number one player from the country. He’s actually a German-born Aussie of Croatian and Bosnian descent (if that’s not too hard to grasp) so there will probably be several countries trying to convert the flag next to his name. History regarding his nationality has landed him in hot water in the past with his dad – who’s also his coach – threatening to force Tomic to play for Croatia, whilst an incident with Hewitt a while ago means he’s by no means a straightforward guy to predict. Taking in mind his successful record in the southern hemisphere and the support he’ll receive from The Fanatics in the future, if he stays to his Gold Coast roots then Australia’s heir to Hewitt could be just, if not more, of a success. Since 2003, America has been awaiting a male Grand Slam winner. Andy Roddick won the US Open on his own turf eight years ago and still remains the only real chance of adding to the illustrious legacy of a dominant tennis nation. Roddick very nearly won Wimbledon in 2009 but at the age of 28 his chances of building on his solitary Grand Slam victory are slipping. It’s perplexing how a country which has spawned legends such as Pete Sampras, Andre Agassi and John McEnroe is running out of talent at the highest level. It’s very much a similar story for Australian tennis too. Not since Lleyton Hewitt won Wimbledon back in 2002 have we seen the Aussies challenge at Grand Slam level. Although not enjoying the same kind of history as the USA, with Mark Philippoussis and Pat Cash being the only other notable players in the last 30 years, they did produce tennis legend Rod Laver and the passionate sport-loving Australian public demand competitors in the Grand Slam event they annually host. There is, though, hope that both countries could end their barren runs and it comes in the form of two 18-year-olds. 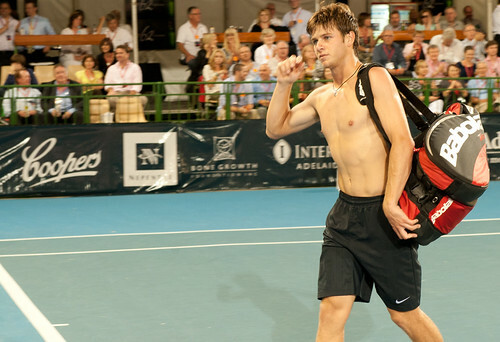 At number nine in the USA’s best ranked players and at 156 in the world’s, Ryan Harrison could be the next Grand Slam contester and take over the mantle of Roddick in two or three years. Being an American automatically gives Harrison an advantage of great home support at Flushing Meadows enhancing his US Open chances in the process. Australian Bernard Tomic is in the same position. Like Harrison, Tomic is currently sitting outside the top 100. On paper, you’d be forgiven for thinking he’s another product of the Eastern European tennis machine churning out talented players every year but, although of Croatian descent, he is from Down Under. That home advantage has already begun to have an effect with Tomic mustering a third round run at this year’s Australian Open. But be warned, the teen has also gained a controversial reputation in his short career so far. He’s been quoted as saying compatriot and former world number one Hewitt was “not good enough” for him to practice with whilst his father and coach John has threatened to convert his nationality to Croatian. That could hinder his dreams greatly as his support on and off the court wouldn’t be at the same level. Even if Tomic and Harrison don’t make Grand Slam winners it’s crucial for both countries to encourage new talented youngsters to pick up a racket. Currently the Williams sisters and the recent success of Sam Stosur have been keeping US and Aussie fans content but after their reign ends there’s little waiting in the wings to keep the respective legacies going. Harrison and Tomic therefore play a more important role than just winning tournaments, they must also win over new tennis fans and the stars of the future.